1.Serpent’s Stout from The Lost Abbey. A winter warmer with French roast coffee, dark chocolate, deep malt and a touch of vanilla. 2.Recycled Beer Glasses from Uncommon Goods. Handmade in Columbia from discarded, recycled and re-purposed glasses. 3. The Ontario Craft Brewers Discovery Pack from the LCBO. Six of Ontario’s finest beers. 4. Handmade Brew Slate Coasters from BadLuckArtCo. Super fun beer mats mounted on slate and completely waterproof. Fantastic Idea. 5. Stone Brewing Co. Tour. The tours are free and include a guided beer tasting. Or if you really love the Beer Geek in your life a whole tour of the Cali Brewing Scene followed by a little surfing (hint, hint). 6. Gift certificate(s) to participate in one of the many great beer tasting events happening in BC’s Lower Mainland, shop at one of our great independent liquor stores and/or imbibe at a great tap houses. 7. 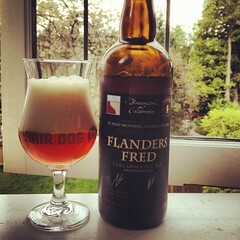 A Beerquet from 99 Bottles; like flowers but drinkable! A hand-selected assortment of six beers from their stellar collection AND a gift card to boot. Who says you need to say it with flowers. 8. Beer Gear like “Stay Pretty & Drink Real Beer” T-shirt or Brewelry (jewellery handmade from old kegs) from Pretty Things Beer and Ale Project. 9. Home-brewing Course at the Vancouver Pastry School (extract brewing for the beginner and all grain brewing for the advanced) or a home-brewing start-up kit from Dan’s Home-brewing for those adventurous sorts that just like to wing it! 10. Antique Irish Guinness Beer Pulls, Bar Taps, from Stoneybatter Pub, Dublin, Ireland. 11. Beer Books. There are quite a few good ones but for an all-round great and easy read with lots of information on all things beer related you can’t beat Randy Mosher’s Tasting Beer. For something more in tune with the season try Christmas Beer by Don Russell. 12. Vintage Retro Inspired Rustic Cast Iron Bottle Opener from the Shabby Shak. Never go searching for your bottle opener again (Etsy listing). This is not so much one review but rather an overview of my sampling of several beers in an attempt to broaden my palette before attending the craft beer tasting at Firefly Fine Wine and Ales. Worried about appearing like a beer ‘rookie’ in a sea of cicerones I had a couple of friends over to assist me in a little research ie. ordering pizza and drinking beer. With all good intentions to carefully document the evening I instead found myself staring at a counter full of empty bottles trying to recall the differences between beer 1 and beer 10. So instead of doing a disservice to any of the bevies I tried I am going to offer some thoughts on what I liked…I think…If I remember correctly. 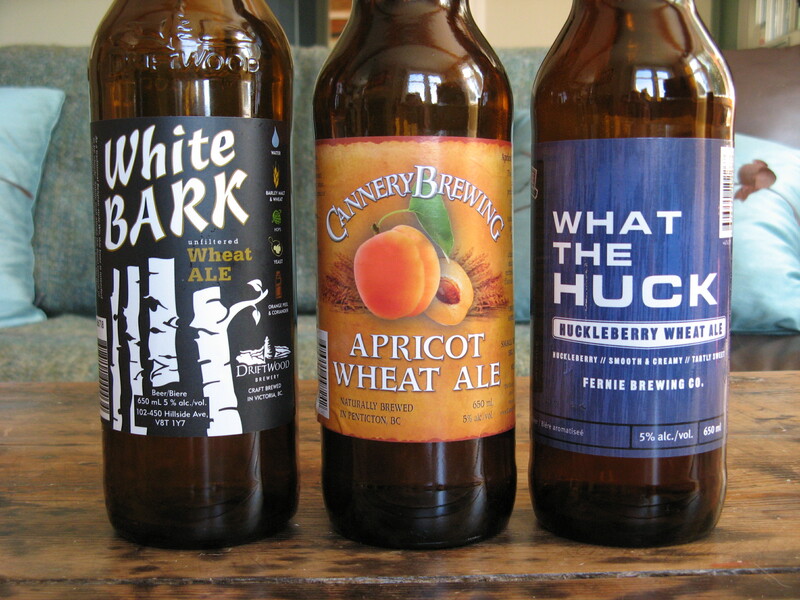 We commenced the evening with a ‘What the Huck’ Huckleberry wheat ale from Fernie Brewing Co – great name! Yet another summer fruit varietal this one being more on the tart than sweet side. The liquid is, well, the colour one might expect from a berry beer slightly purplish with a golden undertone. This ale is very light only 5% making it a nice starter beer for the night. 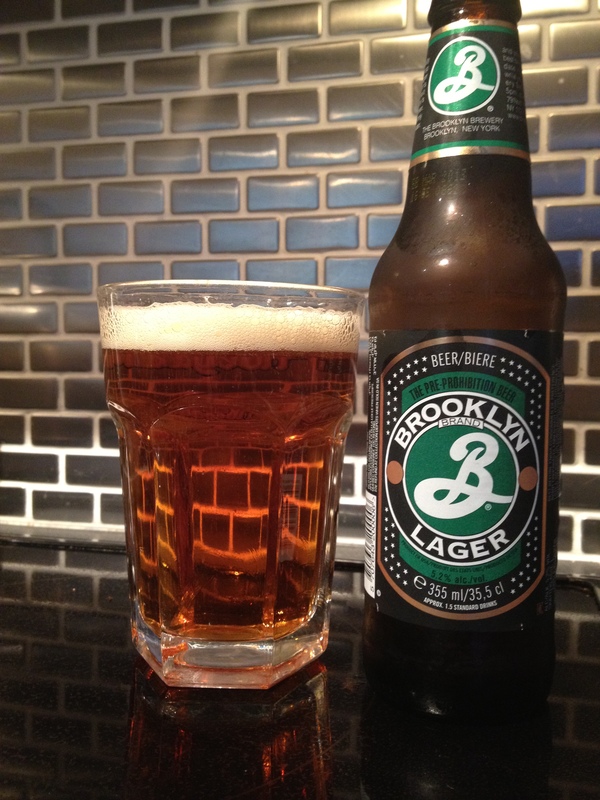 We followed up with Brooklyn Local 2 a nice crisp ale with honey and citrus peel. It almost has a flavour like a Hefeweizen but based in strong ale. The honey flavour was nice and mild, not overpowering, and in the glass the beer is a dark orange-red hue with a dark foam head. At the same time we cracked Cannery Brewing’s Apricot Wheat Ale which I enjoyed but was not blown away with. Apricot is a subtle flavour and competing with the Brooklyn Local 2 I found I was not drawing a lot of taste from this beer – but to be fair had I tried this first off my opinion may have swayed. Moving right along, the White Bark Wheat Ale from Driftwood Brewery and just to get this out up front –this beer has a fantastic label, as do all the Driftwood beers. This white beer puts itself up against the myriads of Belgian style wit beers on the market and it fairs well against the competition. Not to overstate the obvious but I like white beers and this did not disappoint. It remained cloudy in the glass, nice head, and a good ‘bite’ from the coriander and orange – I personally like that these elements play against creamy texture of white ale. So my astuteness tends to slip slide a little downhill after this as I moved onto to a couple entries from Hitachino Nest, the Weizen and the White Ale. While I usually really enjoy this brewery I was disappointed with the Weizen. The beer had a really odd sweet and sour quality to it that I did not enjoy almost like it should have been drunk as an aperitif. The white ale on the other hand was good -granted at that point in the evening my vocabulary did not extend much past this beer good that beer bad- not the best white beer but not the worst; it claims to have nutmeg so if you like ginger snaps give it a go. Now a word or two from the dark side, I am a lightweight not only in amount I can drink but also in the strength and viscosity of my beers so my obliging better half took on Pretty Things Sylvan Stout by Pretty Things Beer and Ale, the Raven’s Eye Imperial Stout (Organic) by Eel River Brewing Company, and Madrugada Obscura Dark Dawn Stout by Jolly Pumpkin Artisan Ales. Coincidentally enough he ranked them 1, 2, 3 in the order listed. 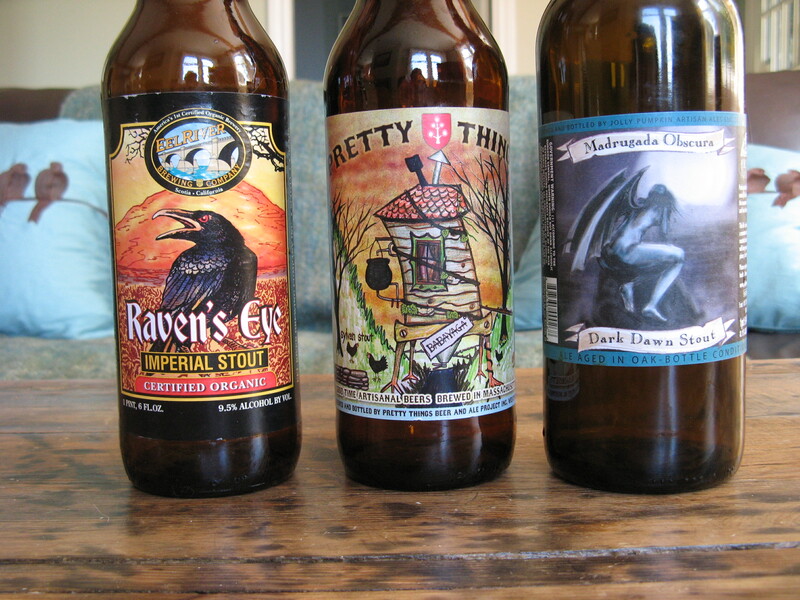 Some further thoughts…Pretty Things was a java stout, heavy on the coffee but not a thick stout, while Raven’s Eye was similar with less obvious coffee overtones. The Madrugada Obscura on the other hand was very unique it had a fermented ‘bubbly’ quality, which is somewhat challenging in a stout. Being the last beer of the evening it may have unfairly been given the short shrift but hey whatcha gonna do?